Hudson Heights is a wedding and event band ranging from 6-8 pieces. 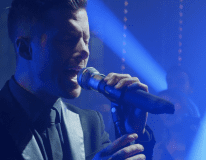 They provide a range of live entertainment services, from intimate acoustic sessions to high energy, full band performances. Their musical versatility is their greatest strength – they can quickly transition from an instrumental jazz cocktail hour to a large room dance party. Though there are six permanent members, they come with the value of a 7 – 10 piece band. The instrumentation between the four musicians includes: electric and acoustic guitar, bass, upright double bass, keyboard, trumpet, saxophone, drums, and cajon. 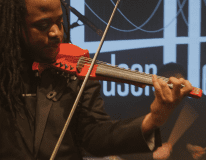 The band offers the unique ability to add an electric violinist and sax player to compound their dynamic sound. Hudson Heights is fronted by two singers, Danny & Eden, who double as event emcees. 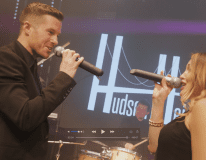 The vocal abilities of Hudson Heights’ singers allow the band to cover a wide range of genres from 50’s pop and rock to today’s hits. 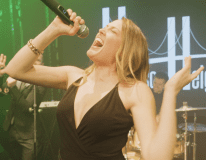 By traveling with a full time sound technician to perfect the levels, coupled with tasteful band lighting, Hudson Heights delivers an interactive and energetic show to complete an epic event. If you are between a DJ and a live band, why not combine the two and get the best of both worlds? EMG specializes in the band/DJ combo option. Whether taking turns or playing together, Hudson Heights and the DJ will create specific arrangements to seamlessly transition into each other’s sets so that the dance floor never empties! Hudson Heights is a rare combination of youth and experience. Their talent, creativity, and showmanship provide all the right elements to turn a memorable day into the party people can’t forget. Register to come see Hudson Heights at their next public showcase.